Cobblers boss Dean Austin has declared he will never ‘speak about players who are under contract to other clubs’ - and that if any deals are done then it will be the club’s supporters who ‘will be the first to know’. After a quiet summer on the transfer front to date, there has been plenty of speculation in recent days, with Town being linked with a possible move for transfer-listed Peterborough United forward Junior Morias. Social media was alive with rumours after Posh director of football Barry Fry said there has been ‘interest’ from the Cobblers with regards to the former Wycombe Wanderers man, although chairman Darragh McAnthony then declared on Twitter there was ‘little chance’ of him switching to Sixfields. 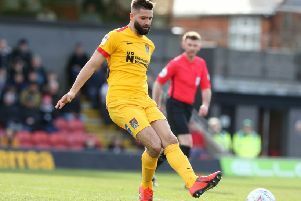 But Austin has made it clear he is not interested in commenting on any speculation, whether it be players being linked with a move to Sixfields, or away from the Cobblers. “I won’t speak about players who are under contract to other clubs,” said the Cobblers boss. “I would hate it if another club spoke about any of our players and so I certainly won’t be doing it myself. There has also been plenty of chatter on social media with regards to Cobblers forward Billy Waters interesting other clubs, with Port Vale the main whisper, but again Austin will be staying tight-lipped on that, and any other rumours regarding Town players. “We will go about our business, and speculation will come and go,” said the Town manager. “Some of it may be true and some of it may be wide of the mark, but we won’t get drawn in to confirming or denying speculation.